Do You Wish You Could Stop Worrying? Do you often feel anxious about grades, school and your social life? Are you worried that people are gossiping and saying judgmental things about you? Do you frequently find yourself worried and losing sleep over things you said or did during the day? Have you experienced repeated unexplained physical discomforts, such as an upset stomach, racing heart or shortness of breath? Do you worry that you’re not “normal”? Do you wish you could worry less, relax more and handle life with greater ease? Between school, extracurriculars, friendships, new romantic relationships and all of the other changes that come with adolescence, the teenage years can be stressful, frustrating and extremely confusing. You might see your peers acting calm and carefree and wonder why everything feels so hard for you. Or maybe you spend most of days on edge, unable to shake the feeling that you look wrong, talk wrong and act wrong. You may even have experienced a “panic attack” where you felt like you were going to die or needed to escape a situation immediately or something else bad may happen. Perhaps racing thoughts consume you from the moment you wake up until you finally fall asleep in exhaustion late at night. You may start the day already thinking about that person you don’t want to run into, that test you feel unprepared to take or that presentation you’re sure will be humiliating. You may feel as though, at some point in your day, you are sure to look foolish or make some sort of mistake that will impact the rest of your life. Maybe after school, you just want to be alone. You might often avoid everything because it is just too much. Maybe you feel exhausted, frustrated and alone. So many teenagers fear being perceived as stupid, foolish or weird, or feel that they just cannot face some of the stresses in their lives. While it may look as though your peers and classmates always feel calm and secure, they likely share some of your same worries and concerns. The teen years include increased academic obligations, a stressful social scene, the pressures of navigating dating and changes in your body. Sometimes, it can feel like you are both growing up too fast and not growing up fast enough. Some of these worries are normal, but we know that 8-10% of teens will suffer from an anxiety disorder, and that many of these go undiagnosed for years. While you may be more aware of anxiety symptoms now, if you feel anxious as a teen, you likely felt anxious as a child as well. As a teen, you have a greater awareness of the long-term impact of what you do and how you are perceived. 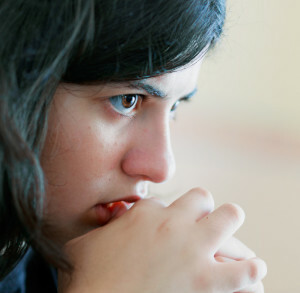 Many teens are very critical of themselves, which can lead to worry and unhappiness. Sometimes, anxiety can be a healthy response to stress in your life. But, if your worries and fears are keeping you up at night, making you want to avoid school, preventing you from seeing friends or getting in the way of the things you want to do, it may be becoming a more serious issue. Thankfully, there is a way to find relief. Left untreated, anxiety can continue to grow and persist into your adult life. But, as a teenager, you can learn how to stop allowing anxiety to control you and develop the coping skills needed to enjoy peace, joy and confidence throughout life. During teen anxiety treatment sessions, I can provide you with new techniques to slow down your racing thoughts and relax the tension in your body that may be causing aches and pains. Together, we can identify the triggers that set off fears and intense worry. If these triggers come from external sources, I can help you discover ways to face those stressful people, situations and things with more confidence. If your worries are primarily internal, I can help you challenge anxious and negative thoughts so that you can stop them before they take over your mind, emotions and body. Soon, you can begin to feel more control over the things that make you nervous and more prepared to face challenges throughout each day. In teen anxiety treatment, I offer a safe space for teens to talk about anything that they want. I will never judge you, and everything you say to me will be held I confidence, unless I believe that you could be seriously harmed by yourself or others. While anxiety often doesn’t have an identifiable source, some teens develop anxiety after a traumatic event. If something has happened that is making you feel fearful and on-edge, I can help you process those emotions as well. Stress is a part of life. In school, they teach English, math and social studies, but they rarely teach stress management and other life skills. Therapy is a great place to learn these important tools. You will learn how to manage stress, face fears and stop anticipating the worst-case scenario. In a trusting, safe environment, you can begin to feel more at ease and enthusiastic about life. You can enjoy your teenage years and pursue the life you want. What will people think if they find out I am in teen anxiety treatment? Many teens worry that seeking help means that they are broken in some way. This is not the case. There is nothing wrong with asking for help. In fact, seeking therapy when you are feeling stuck and in pain reveals how brave you really are. Furthermore, because therapy is confidential, you don’t have to tell anyone that you are engaging in the process if you don’t want to. A parent or guardian will need to give permission for me to see you, but I explain to parents how important it is for you to have a safe, confidential place to share your concerns. There are a wide variety of mental healthy disorders, and while anxiety is distressing, it is also very treatable. Everyone experiences stress, and many people struggle with anxiety. You are not alone or broken. You just need to develop the tools needed to challenge negative thoughts and manage stressful situations. I was never this way before I went through something frightening, and I don’t want to talk about it. If you recently experienced a frightening event that produced or increased worry or fear, you may be suffering from trauma. Traumatic events can have a significant impact on your emotional, mental and physical well-being, and anxiety is a key symptom of trauma. If you believe that your anxiety has been incited by a trauma, there is help available. With therapy, you can process feelings created through the traumatic experience and begin to feel better sooner. I know people who were given medication for anxiety. I don’t want to be zoned out on pills all day. You may have seen a friend or family member start a medication and begin to zone out or stop engaging with life. In the past, doctors sometimes prescribed medications that were meant for the short term, but were used as a long term solution. There are more appropriate medications that can be prescribed that have fewer side effects than those you might have seen in your friend or family member. While medication can be useful, many teens experience relief through therapy alone. If I believe that medication could help you experience relief, I will discuss it with you as an option and help you prepare for your appointment with your doctor to discuss medication, but I will never force you to take it. You have a choice. If you are tired of feeling held back by anxiety, I invite you to call (808) 747 3445 for a free 15-20-minute phone consultation to ask any questions you have about teen anxiety treatment and my practice.